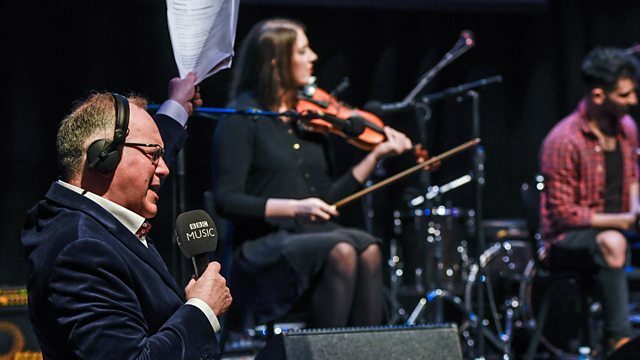 The Rachel Newton Trio, Talisk Trio and singer Robert Robertson join BBC Scotland poet-in-residence Stuart Paterson for a Burns Night celebration with Jamie MacDougall. Spend Burn's Night with Jamie MacDougall in the company of two award-winning groups, live from the CCA Glasgow. BBC Radio 2 Musician of the Year singer and harpist Rachel Newton performs with her trio that includes Lauren MacColl on fiddle and Mattie Foulds on percussion. The night culminates in a dynamic set of tunes from Talisk Trio with concertina player Mohsen Amini - Young Traditional Musician of the Year 2016, fiddle player Hayley Keenan and guitarist Graeme Armstrong. A Burn's Night without poetry from the Bard himself would be a sair fecht, so readings and musings on the night come from BBC Scotland's poet in residence Stuart Paterson.